Wednesday 20th March. From Accra to Kumasi. 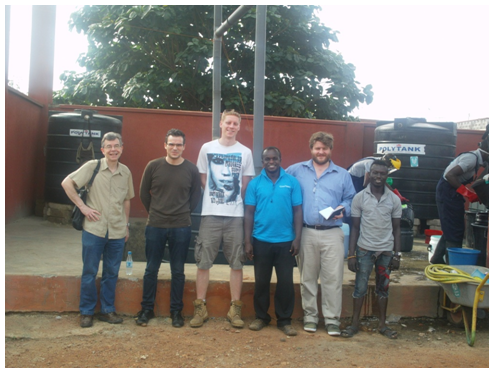 After recovering from the journey from the UK to Accra on Tuesday 19th of March, the Cranfield University´s team made up of Dr. Richard Franceys, Dr. Leon Williams, Ross Tierney and Eloy Pérez López, began the sensitization trip to Ghana. Our team travelled to Accra´s coach station, and on our way we took note of certain items that are flourishing and widely sold in the Ghanaian society like mobile phones, fridges, air conditioners, internet connection, plasma television’s, etc. Moreover, we found many Ghanaian street vendors selling water, mango, tissues, clean products, toilet roll. The last one was a reminder of our trip´s aim, to sensitize about the living and sanitary conditions of Ghanaians. Once we arrived at Accra´s chaotic coach station, we boarded a coach and waited for three hours for it to completely fill up before we could depart (a pretty common and very frustrating occurrence in many African coach stations). An interesting four hour journey helped us to see some different types of houses and shops on our journey. The main road to Kumasi is a two-lane tarmac highway that is still under construction. During the journey, two people lead prayers and songs for the passengers reminding us of the great role that religion plays in everyday Ghanaian life. After our four-hour journey, we finally arrived to the Engineering Guest House at the Kwame Nkrumah University of Science and Technology (KNUST) where we met Napoleon, a Ghanaian student of Richard who would act as our guide whilst we were there. On Thursday, we met the managers and workers of the Clean Team, a Unilever sanitation project based in Kumasi that includes a former Cranfield student, by the name of Faustina. Clean Team is a sanitation entrepreneurship that is currently providing toilets to the dwellers of Kumasi's peri-urban areas of Ash Town, Alabar and Abondo. These populations do not have sewage network. The toilets are designed to store the faeces and urine until they are collected by Clean Team's employees in the highest hygienic conditions. 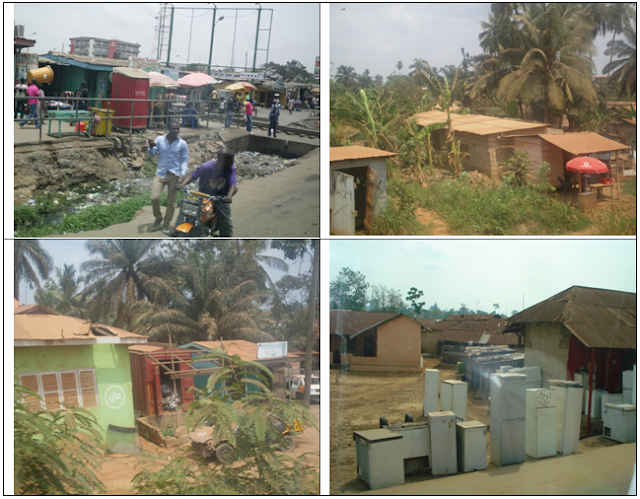 When we visited the Clean Team were serving approximately 150 households, and have an ambition to scale to 1,000 households by the end of 2013. The toilet design allows the collection of the urine in a separate container to be emptied by the user, while the faeces is kept in a container that holds seven litres of a mixture of water and a biodigesting chemical that also acts as an odour control. The buckets are collected twice, three times or every day depending on the number of users and the monthly bill that they are paying. Once the Clean Team employees collect the waste from the customers, they are transported by trolley and motor-vehicle, to the company’s storage containers. Once these vessels are full, they are emptied by cistern lorries which discharge its wastewater load into sewage lagoons. After meeting the managers, we went to visit the installation of one toilet for a new customer, and to meet other customers. They told us that these toilets are an improvement for their lives and specially for disabled or ill people. After visiting the Clean Team, we went to see the public toilets of the area, the people told us that every morning they have to queue to go to the toilet. At peak-time, the queue can be up to one hundred people. There are different prices and standards between flushing toilets and latrine ones, $0.15 and $0.1 respectively. There is also a different cost for using newspaper or toilet paper for cleaning. We were told that newspaper is the more popular choice. In the afternoon the team were greeted by the Waste Management Chairman of the Kumasi Metropolitan Assembly. He was a former student of Dr Franceys 20 years ago. After an interesting meeting discussing the sanitary solutions on a large scale he arranged for an official car to take Richard, Napoleon, Faustina and Eloy to the sewage lagoons-based treatment plant and landfill. The team also observed a research project trying to produce a new type of Biogas from human waste in partnership with a Columbian company. At the same time, Dr Leon and Ross went to visit the Design Centre at KNUST. They had an interesting discussion about design facilities and capabilities of the university and local industry. After a very interesting day the Cranfield Team flew back to Accra. In the morning, we took a taxi to meet Kweku A. Anno, Director of Biological Filters and Composters Ltd. This is a sanitation business, which provides an innovative composting toilet for its customers. Biofilcom has installed the system in over 2000 locations around Ghana, including Anglogold Ashanti’s Tarkwa facilities and the HFC Bank with most installations usually requiring little or no excavation. Kweku explained to us the advantages of their Biofil Toilet System. The system is able to break down solid organic waste up to thirty times faster and more efficiently than the traditional septic system. This also means that the system can be up to thirty times smaller than the septic system. The waste is typically broken down within two weeks, and there is very little odour generated in the system. Also, the only by-product, which is the filtered waste water, that can be re-used. This type of toilet can utilize the nutrients of wastewater to feed banana plantain, or other tropical plants in your garden. After comprehensive discussion about their systems and our proposed system, we left to visit two more local areas; Nima and Agbogbloshie, where the lowest-income dwellers in Greater Accra reside. In Nima we visited one of the public toilet areas, and the market road. We took note of the availability and cost of products in a hardware shops in Nima’s market. After Nima, we went to visit the slum of Agbogbloshie. We observed that the two types of economic activity that support the life of its dwellers, trade and dismantling of electronic waste in unsafe and unhealthy conditions for recycling. These were full days of sketching and working through ideas between Leon, Ross and Eloy to try to design a suitable system and layout for the components before leaving Accra on the evening of the 24th. All members of the team were in agreement that our main purposed of sensitization trip has been fulfilled. It was overall an unforgettable and incredibly useful experience for gaining a better understanding of the living conditions, aspirations and needs of low-income and middle-income communities who are potential users of the Nano Membrane toilet.